The third course for this year's White Truffle Dinner was Dungeness Crab Cake with White Truffle Creme Fraiche & Cucumber Foam. The original idea behind Course 3 was to have a small seafood selection to transition out of the soup and salad courses and to continue to build toward the apex of the menu in Courses 5 & 6. Although that basic purpose has remained intact through all four renditions of the truffle menu, the precise composition of the third course has changed over time. Indeed, my guests might be tempted to conclude that Course 3 is the most "experimental" portion of the menu, as it's the one spot where I feel the least degree of commitment to a preconceived ingredient or concept. Still, a review of what we have served to date reveals some recurring themes. Crab is one of them; white truffle creme fraiche is another. And although I'm sure that I will move on to explore other ingredients at some point, this apparently was not the year. Instead, I decided to see whether another flavor that pairs well with crab -- cucumber -- could be integrated successfully with creme fraiche and white truffle. One of the things that I value most about planning and presenting these annual dinners is the opportunity to learn something new, whether it relates to an unexplored cooking technique, an unfamiliar ingredient, or a new flavor combination. Thus, when it came to my curiosity about the cucumber, the last thing in the world I wanted to do was use the vegetable in its natural state. After all, where's the challenge in simply slicing or dicing a cucumber and throwing it together with crab and creme fraiche? No, I wanted to try something that I had never done before. My first thought was to use a gelee. Ron Siegel, Executive Chef at The Dining Room at the Ritz-Carlton, uses a variety of gelees to great effect in concert with different types of sashimi; Roland Passot at La Folie serves a delicious apple gelee with crab, and a Meyer lemon gelee with lobster. Why not create a crab salad using the white truffle creme fraiche, and then place the mixture into a cylindrical mold above a thin disk of cucumber gelee? I did not start experimenting with this until one week before the dinner, and among the immediate challenges I faced were how much liquid I needed in order to obtain a gelee of the proper thickness and how much gelatin I had to use to achieve the proper consistency. I consulted my copy of The Professional Chef on the latter question and estimated the amount of gelatin required for a set that is just firm enough to hold its shape. I ran three cucumbers through my juicer (noting for future reference that the result was roughly 2 cups of juice), and then proceeded to confront the next quandary -- i.e., how to dissolve the gelatin into the juice. Everybody knows that you typically need to warm up a liquid in order to melt the gelatin, but would cucumber juice be able to stand the heat? Even if I put it over a low flame, would it separate? And how, if at all, would the flavor be impacted? I put a small amount of the juice in a sauce pan to give it a try, and what I found certainly caught me by surprise. The heat did not seem to change the appearance of the liquid, but it did dramatically alter its flavor. What once tasted like the purest essence of cucumber had now mysteriously picked up unpleasant overtones of asparagus -- for reasons that I'm sure only Harold McGee would be able to explain. I concluded that I would have to dissolve the gelatin into a small amount of heated water, and then blend that water (once cooled a bit) with the juice. The cucumber flavor would admittedly be a bit more diluted this way, but I simply saw no other choice. Two hours after putting the cucumber-water mixture into the refrigerator to set, I pulled out the tray. Although the gelatin seemed to have the consistency I wanted in terms of how it would interplay with the crab when tasted, it was not quite firm enough to stand up to any manipulation. Feeling rather dejected, I sat in my kitchen and thought about whether I had any hope of figuring out the optimal ratio of gelatin to liquid in the days that remained before the dinner. It was time to start considering alternatives. Foams have now become de rigueur in upscale restaurant dishes, almost to the point of cliche. Yet, I've had very little experience with them at home, and I suspected that most of my guests had rarely seen them outside of restaurants either. Why not give it a try, I thought. I read several explanations about how dissolving gelatin into a liquid before sealing it in an iSi Gourmet Whip gives the foam more body when dispensed, so I set off to determine the correct amount of gelatin to use. Because cleaning my juicer is a pain, I decided to run the first several experiments -- relating only to consistency -- on pineapple juice out of a carton. The first foam I tried on Sunday was too soft, but the second one on Monday evening was just right. I then returned to working with actual cucumber juice, as I still had to figure out the proper level of seasoning. I learned from Harold McGee's book that the presence of salt in a liquid weakens the effect of gelatin, so I had to experiment with ratcheting up the gelatin concentration after I knew how much salt I wanted to add to the juice. This went on for a few days, as I set aside time before or after work to prepare another experimental run or to check the results from the last one. By the time I had finally achieved an acceptable result on Wednesday, I had gone through half a gallon of pineapple juice, two boxes of Knox gelatin envelopes, 18 nitrous oxide chargers for my Gourmet Whip, and the juice from 15 cucumbers. 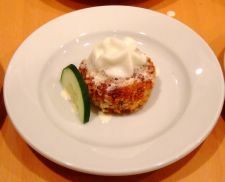 I figured that a cucumber foam would make little sense with a crab salad, so I switched gears and resorted to a modified version of a crab cake that I had served at the first White Truffle Dinner three years ago. Instead of Maryland Blue Crab we used Dungeness, and in place of half of the regular breadcrumbs we used panko. On the night of the dinner, Rhonda pan fried the crab cakes to golden brown perfection while I put the creme fraiche into a piping bag. 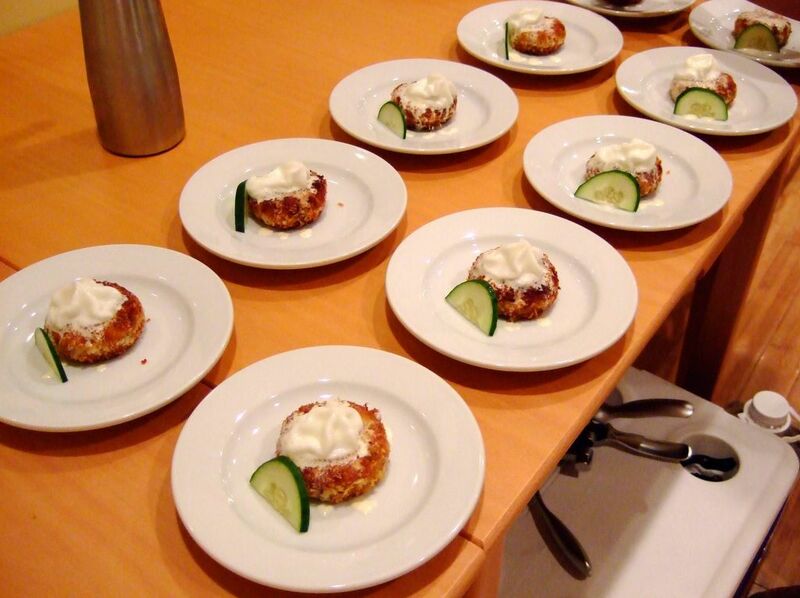 We placed a crab cake in the center of each plate, drizzled some white truffle creme fraiche on top, and then finished with a small dollop of cucumber foam and a cucumber slice for garnish. 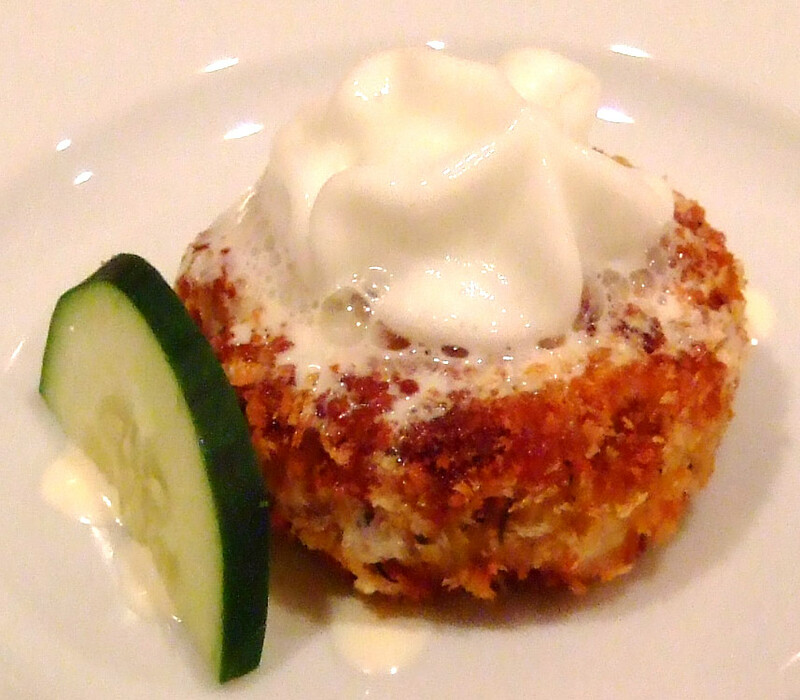 crab cakes, one of my favorites. Did you use gelatin or agar-agar? Gelatin is usually made from animals and Agar-agar from seaweed...maybe using agar-agar would keep the cucumber flavor? Kat: I used regular powdered gelatin. I've never worked with agar; I'll have to give it a try sometime. As for losing the cucumber flavor, the primary problem was that I had to heat the juice in order to dissolve the gelatin. Unless agar can be dissolved into liquid without heating, I suspect that I may end up facing the same problem may arise! I have found great luck using gelatin sheets instead of powder. The gelatin dissolves easier. I, too, throw a multi-course dinner for 12 every other year called the Last Supper. I love your stories here. Thanks. This is one of my favorite menus. But unfortunately my culinary courses do not make food like this. I'd love to follow this course to make food like this and makes other foods that much better.